The attack began just after dark. Approximately 16 enemy guerrillas arrived in two vehicles. They pulled up and piled out of a minivan, then emplaced security with at least one light machine gun and an RPG. They brought two mortar tubes and two sacks of mortar rounds. The guerrillas had training in the use of mortars, and their coordinated movements betrayed that they had done reconnaissance, calculations, and rehearsals. Yet the fact that they were not skilled commandos burned brightly. Actually, "flickered in the night" is probably more accurate, since they used cigarette lighters to dial the mortar sites. The air was still that night. Had there been any wind, they wouldn't have had enough light to dial the mortar sites. While some guerrillas pulled security, others placed the mortar tubes, assisted by men who dumped the two sacks of mortar rounds on the ground as if they were bags of corn. They were almost ready to shoot when . . . something must have tripped off the security man with the machine gun; he seems to have fired a short burst, which spurred the mortar crews into a hasty push to fire and evade. "Allah u Akbar!" cried the men when they dropped rounds down the tubes . . . BAM! "Allah u Akbar!" (God is Great!) BAM! American counter-battery radar acquired the shots. The bombs were flying straight toward FOB Gabe. In fact, they were flying straight toward the counter-battery radar and its crew, who had seconds earlier detected the launches. "Counterfire, counterfire, counterfire" would have been the first three words from the Americans in response to the attack. The radar crew knew the point of impact before the bombs exploded. BLAM! Impact. Their ears verified their computers. The enemy normally fires two or three mortar shots and evades, but not this time: "Allah u Akbar!" BAM! The radar can pick out individual rifle bullets; the mortar rounds were relatively gigantic. But detecting the bombs does nothing to change the trajectory and these were flying straight at the radar crew. While insurgents kept shooting, the counter-battery team radioed the point of origin. The crews for the 155mm American cannons on FOB Gabe were preparing for the order to counterfire. They could kill every large mammal around the mortar tubes in roughly two minutes, maybe a bit faster, depending on the crew, the range, and the breaks. But the trajectory plot showed that the insurgents were firing from a populated area; the insurgents knew that the Americans would not shoot the big guns into a neighborhood. "Allah u Akbar!" BAM! The deadly shots kept coming, BLAM! and landing near the radar. The enemy's decision to hide behind their own innocent people worked, like it normally does; the Americans opted not to fire the big guns. 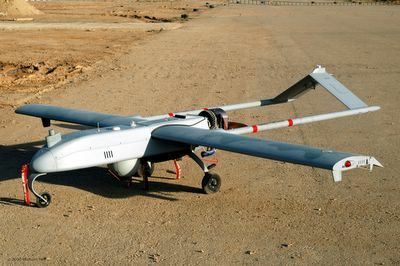 The Shadow UAV had been harmlessly prowling the skies over Baquba; just flying about, more or less, waiting for something to happen. While the insurgents kept shouting "Allah u Akbar" and shooting, the Shadow's camera was beaming a live feed to the American bases. But the UAV was looking somewhere else at that moment. So when the Shadow platoon leader on FOB Warhorse, Lt Liesl Himmelberger, heard the radio call: "Counterfire, counterfire, counterfire," her first words to her Shadow platoon were: "Gabe is getting incoming fire from Baquba." "Do we have a grid?" asked Staff Sergeant Lukas Johnson. Lt. Himmelberger calmly read off the coordinates, which were entered into the computer and uploaded to the Shadow where, a mile above Baquba, the Shadow camera started panning toward the mortar tubes. The insurgents were only a couple minutes away when the UAV made a sudden turn straight for them. "They just picked up 15 to 20 mortar rounds," Lieutenant Himmelberger said into the radio. "Gabe just took 15 to 20 mortar rounds from this point," Himmelberger. The Shadow platoon had not yet spotted them, but during the insurgents' final shot, "Allah u Akbar!" instead of the BAM! there was distinct "clink." A shot got stuck in the tube; the mortar did not fire. As if they were magic incantations, the insurgent seemed to try again by saying, Allah u Akbar. Nothing. The bomb waited obstinately in the tube. The insurgents had options: they could leave the mortar tube behind and lose their weapon. They could take the tube in the minivan, but at any moment it might fire and kill all of them. Or they could try to make it fire. They tried to make it fire. Seconds, seconds, seconds ticked by . . . maybe the insurgents should not have dumped those rounds on the ground . . . more seconds, more seconds; more seconds. Nearly a full minute elapsed since the last shot, when: BAM! "Allah u Akbar," yelled one of the men, triumphant as the last bomb began its arc toward FOB Gabe. The insurgents stopped videotaping at around 7:50 PM, Baquba time, just as the Shadow got eyes on them, and the view from the sky suddenly became very interesting to everyone watching the monitors on the base. The Shadow locked onto the coordinates: "How's that for responsiveness?" said Specialist Fenter, and then, "What's that hot spot on that, over there to the right?" "Yeah, I see it." Himmelberger. "Yep," said Himmelberger, "It's a hot spot." "There's a bunch of people moving. . . . " Fenter. "They're running," said Himmelberger, "They're running. They're running. They're running. Keep on them." Meanwhile, key soldiers all around Baquba were getting calls to fight. Sergeant First Class Carlos Ybarra got a message through his radio: "Ghost Seven this is Bulldawg X-ray. Bring your platoon to Redcon One." "Acknowledge Redcon One," answered Ybarra. Ghost Platoon was hit with 26 IEDs in the past year. Ybarra personally has been hit by eight. His platoon has a special taste for fighting insurgents. As the insurgents began racing away, and the American ground forces were assembling to roll-out, Lt. Himmelberger ordered her crew to follow the minivan with the Shadow. The minivan drove away, then circled back around a block and stopped and picked up a man. More Americans were joining the fight as two Kiowa helicopters dispatched. But for now, there was only the little Shadow; with no guns, its weapons were sharp eyes and radios. Through the Shadow's infrared, the minivan shone black and white as it raced through the streets of Baquba. The vehicle was at times difficult to follow through the crowded streets, and would occasionally disappear behind buildings. To infrared eyes, most of the vehicles on the streets below looked the same: little black and white rectangles darting about, almost like an old-school video game. But, if the crew were to mistake one rectangle for another in the jumble of moving geometry, the Shadow might lose the target and they'd suddenly start trailing, say, a family of innocent Iraqis. Game over. The outcome of this battle would depend largely on the Shadow platoon. Approximately 17 minutes into the pursuit [16:13 Zulu], the rectangle stopped and let a man out. The Shadow crew jotted down the coordinates, and a couple minutes later, the rectangle stopped again, unloaded a passenger, and again, the crew jotted down the coordinates. And when the rectangle drove off in the direction of some open fields, the Shadow platoon alerted the command that the target vehicle was in the open. About a minute later, as the car halted and yet another man got out, Lt. Himmelberger, intently watching it all on her screen, radioed: "We have a Falcon View Grid for this house. Mike Charlie 67949 36066." She turned to her crew and asked: "We're at 65 right now?" referring to the altitude. "So they can't hear us?" Himmelberger. "Uhhhh, with the background noise on the ground now, prob'ly not." 16:20, minivan starts moving again, this time into a wooded area, and Shadow Platoon alerts the command each time the vehicle drives into the open. Himmelberger says to her platoon, "They say that one-six is approximately 700 meters behind." Two infantry platoons from FOB Gabe had nearly caught up to the target. Three minutes later, the vehicle turns onto Blue Babe Highway, does a U-turn, heads west, then takes a right and heads north. At 16:27, two Kiowa helicopters arrive, flying far beneath the Shadow. The Shadow crew identifies the suspect vehicle for the Kiowa pilots, who came with powerful machine guns and rockets. At 16:30 the vehicle stops. Have the suspects noticed two helicopters circling low? After two minutes, as the minivan begins to drive off again, the Kiowa pilots discuss destroying the vehicle. A minute later, the vehicle stops again, but finally at 16:35, the enemy drives into an open area. With very little traffic and a clear shot, the Kiowas could obliterate the enemy; but Colonel Dana Pittard ordered the Kiowas to hold fire. Captured insurgents are a potential treasure trove of intelligence about other insurgents. Dead insurgents are just dead. Ground forces were closing in. Suddenly, the vehicle mysteriously stops in front of an Iraqi police station--apparently the attackers realize attack helicopters are stalking--and a Kiowa calls HQ at FOB Warhorse: "Duke X-ray, Eagle One-Five. Suspect vehicle has stopped in front of what appears to be an IP or IPS building, over." The radios chatter until a pilot calls HQ at Warhorse: "Eagle One-Five, roger. We are holding fire. We are not attacking the vehicle, over." Suspects get out of the car and start talking with Iraqi police, who begin searching the vehicle, apparently unaware they are drawing close to the center of the bull's-eye, and Ghost and Bulldawg platoons are only moments away. It's been about 46 minutes since the counter battery radar picked up the first shots, when Ghost and Bulldawg rolled up and bailed out. Ghost's platoon sergeant, Carlos A. Ybarra, had four men at gunpoint in a cul-de-sac, not certain if they were the suspects, just knowing they were at the right place at the right time. A few more radio calls and a more thorough vehicle search confirmed that these were the shouting shooters. Soldiers from Gabe, using the coordinates that Shadow platoon had taken down whenever the getaway carpool stopped, raided all the other houses, seizing mortars and explosives, and enough propaganda materials to bring in all men--alive--that day. It didn't take long for the videotape to emerge as the classic smoking gun. No one who knows will say how many other raids resulted from the information these men provided, but something valuable had to have been leeched out. In the months I spent at FOB Gabe after this, no mortars dropped into the base.